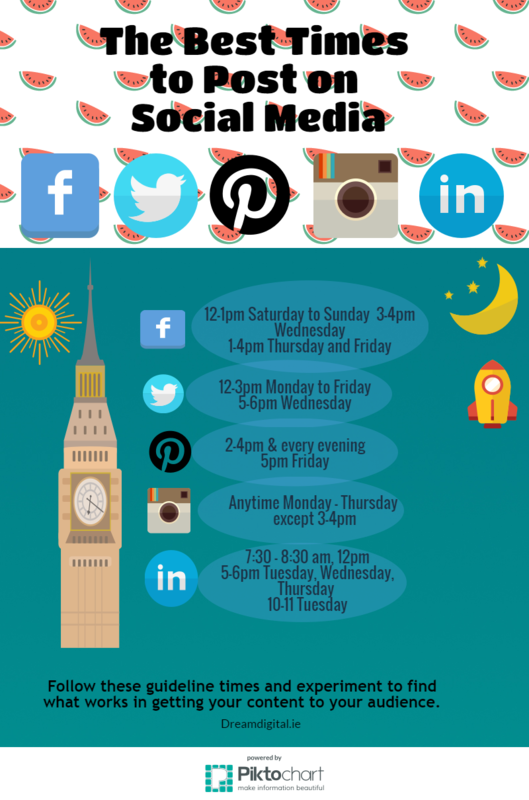 Here are some guidelines that you should consider when planning and scheduling your posts on social media. What you might have already learned from experience is do not post any content that’s too serious on Friday. It will not get the readership that you expect. Keep Friday for the lighter content. The best times generally for scheduling posts with links to blog posts etc are Tuesday to Thurday afternoons for maximum readership. This has proven to work at Dreamdigital.ie so far so good. Keep a steady eye on Google Analytics to really make sure that you are posting at the best time for your followers. Also you can see when your users are on Twitter with followerwonk which is Moz’s excellent tool. As we all know there’s a lot of content coming at us hard and fast through all of our social media channels and it’s about catching your reader at their best time so that they can read your blog post in their own time. Great design is a must as already outlined in this earlier post dreamdigital.ie/how-to-add-great-design-to-your-content/. You have created this amazing content that is compelling and engaging for your existing and new audience. You have posted links to it on your favoured social media channels. It’s being found and read by your audience. Result. Post it more than once to maximise on readership. If you have got a blog post with a couple of infographics and images, you could link to these separately adding this information to your audience for them to catch and get to their interest level at that time. It’s just a way of putting your content out there in little nuggets of interest. They can then come to your website to read more and you are building a loyal audience. We would love to hear your comments and opinions.